The first time I visited New York after turning 21, it was for a party at George Plimpton’s house. I’d only ever been inside one other Manhattan apartment before. Norman Mailer and Lou Reed were there. My best friend told Mailer he’d just read his novel Tough Guys Don’t Dance. “Why did you read that one?” Mailer asked. “I wrote it in a weekend, for money.” None of my friends had the temerity to talk to Lou Reed. I found myself engaged in mutual elbowing with a man about my height in the crowd advancing on the bar. It was Plimpton. He got his glass of Dewar’s on the rocks and I my cup of wine. I put my cup on a table, lit a cigarette, and told Plimpton that his book The Curious Case of Sidd Finch — about a pitcher from the Himalayas with a 168-mph fastball — was the first novel I’d ever read. “What are you reading now?” he asked. I was reading Swann’s Way. “Well, then I pointed you in the right direction.” I picked up my drink and took a swig. It was a bitter slosh of cigarette butts and ash. Wrong cup. Parties are a crucial part of the equation in publishing. The little magazines introduce the talent first, and parties are the way they draw in readers and sell issues, reward the grunts who do the (usually free) labor, and create an aura around their editors. Writers do their work in solitude, but it’s sometimes good for them to get out, too, even when it’s only among kids who will fawn over them. It’s at parties that they play the role of Writer, acquiring allies and rivals. They might even pick up material, an idea, or at least a notion of what not to write. In his notorious memoir Making It, Norman Podhoretz said it was parties and the prospect of talking about their pieces at parties that made writers get their pieces written. After his book came out and all his friends trashed it, he started drinking alone. Then he became a Republican. Minor humiliations, like vaccines, are important for young writers, and I made it back to Plimpton’s house a couple of times after I moved to New York. It was there that a novelist mentioned he’d noticed a recent long essay about the Albanian novelist Ismail Kadare. I sensed that this was my chance. “I wrote that!” The novelist said nothing and walked away, which I see now was entirely appropriate. My anointment would have to wait. In those days, I only knew one guy with a cell phone, and he had a mild obsession with Plimpton. 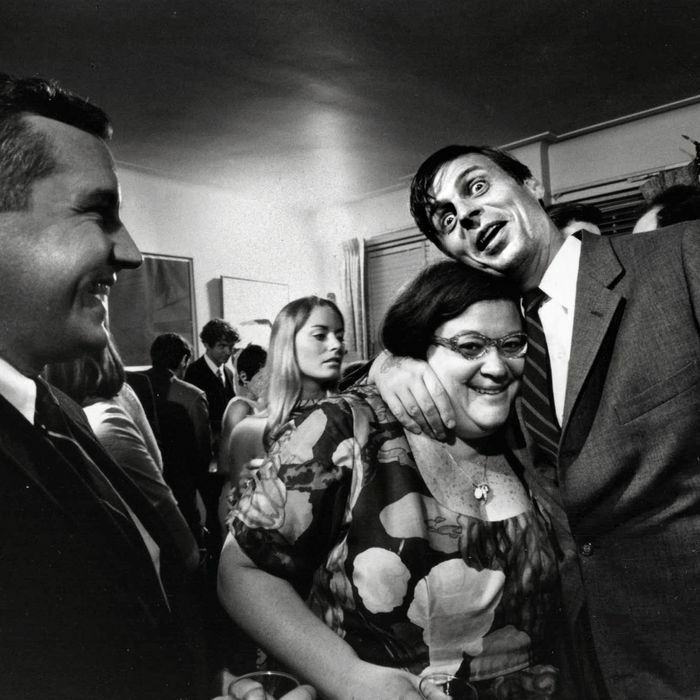 He made his way into Plimpton’s study at one party and called himself from the phone to get the number. A few times over the next couple years, he’d call Plimpton in the evening to gauge his interest in sitting on panels he was setting up — events that were entirely fictional. We knew Plimpton’s assistant in those days, and she put a stop to this. “When you called last night, George was on the phone with Muhammad Ali and had to put him on hold for ten minutes!” My friend was bereft when he lost the phone with Plimpton’s number. But it turned out George was in the White Pages. Open City threw the downtown parties, the cool ones. McSweeney’s was still run out of Brooklyn when I hit town, and I remember lines around the block at Galapagos in Williamsburg for the launch of issue No. 5, the number with the long brilliant story “Mister Squishy,” by Elizabeth Klemm, a one-off pseudonym for David Foster Wallace. A friend of mine got drunk that night and had all the readers sign the Kurt Vonnegut novel he had on him. What’s the market value of a copy of Slaughterhouse-Five signed by Dave Eggers, Sarah Vowell, and John Hodgman? The drunk guy runs a corporate-publishing imprint now. Once I had a real job as an editor at a magazine with a staff of three, no website, and few readers I knew personally. I spent some of my off-hours helping my friends start n+1. I was a “consultant,” and besides showing them how to make a table of contents, proofreading, finding them designers, and writing movie reviews, I tended bar at their parties. I met all my friends that way. The first time the mag tried to make real money off a party, with rich people there, somebody stole the cash box. There was a rumor it was used to start another magazine. At least that was the hope. The best friend I made from going to lit parties was Matt Power. He was a journalist and an activist, had lived in a squat in the Bronx and with the Flux Factory collective in Queens, rode a motorcycle, and flew all over to write his pieces. At lit parties, whenever Matt met a fiction writer, he’d mention that he’d dropped out of the Columbia M.F.A. program because he thought true stories were better than what he could make up. I would roll my eyes and interject that style was the only thing that really mattered. Matt always wanted to crash New Yorker parties to meet his globe-trotting heroes, but I thought you shouldn’t go to their parties if you didn’t write for them. Still, we crashed a few. In general, I learned, you should stay away from parties for rich people, because their purpose is donations and having a good time is secondary. Never go to a networking event. Poetry readings are either the best or the worst things. You can skip any book party because they only happen once, they end too soon, and there’s no narrative to them, especially if you’re not there. I’ve only been to one really good one, for Jon-Jon Goulian’s The Man in the Grey Flannel Skirt, at the Wooly. Things got messy, somebody got sick, and I almost got into a fistfight. That was all after Bob Silvers left. The best way to befriend famous people is to have no idea who they are. Today, Open City is gone, and McSweeney’s is elsewhere. New magazines flare up all the time — Triple Canopy, Gigantic, The New Inquiry, Jacobin, Adult — and transform the landscape, transform what it means to be a magazine. After George Plimpton died in 2003, the offices of The Paris Review moved to a Tribeca loft. Same party, new shape. One night Lorin Stein and I were busted for smoking on the fire escape. A no-no with the neighbors. Lorin is the editor now, and he moved to another loft in Chelsea. An eminence will occasionally appear, Vivian Gornick or Ishmael Reed or Frederick Seidel. I go to see old friends. I’m the little brother of the older crowd now. Matt died of heat stroke on assignment, walking the Nile, in 2014. I still read his stuff. I still miss him at every party.